0-4-0 Tender/Tank No 312 ‘St. 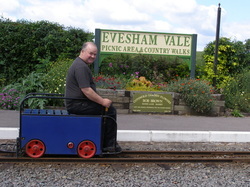 Egwin' was constructed new for Steve Bell by Exmoor Steam Railway at Bratton Fleming, Devon. Delivered in July 2003. Currently in service on the EVLR. David Curwen for Longleat Safari Park. Purchased for the EVLR in November 2004. 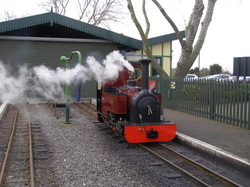 Rebuilt in 2009 with a larger boiler and tender. 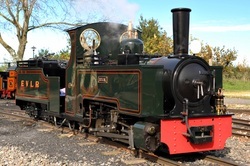 The Exmoor Steam Railway Locomotive No.300 of 1996 has been purchased for use at the Railway. 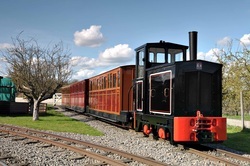 It was supplied new to the Markeaton Park Railway in Derbyshire and named "Markeaton Lady". The locomotive has had a full rebuild including a new boiler. Ruston & Hornsby diesel No. 452280 'Cromwell' was based at Markeaton Park and prior to that at Littlecote House. 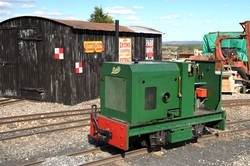 The loco was regauged and converted to hydraulic drive by Alan Keef Ltd, a "new" Ford Engine was fitted during its last overhaul in 2008. 4wDM Diesel Locomotive No JGF4 ‘Sludge' Designed and built by R.L. Lister & Co. in 1955. Bought by Jim & Helen Shackell in 1996. 2 Balcony Carriages & Brake/Saloon Carriages Built by John Ellerton for his ‘Reseau Guerledan Chemin de Fer Touristique' railway in Brittany, France in 1978. Purchased by Jim & Helen in June 1996. 2 First Class Saloon Carriages bult by John Ellerton for his 'Reseau Guerledan Chemin de Fer Touristique' railway in Brittany, France in 1978. Purchased by Adrian & Sandra Corke in June 2016. Under overhaul for use on the EVLR. 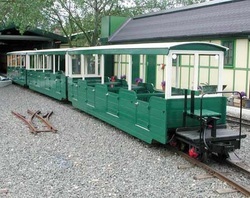 3-car semi open Articulated Set Built by Alfred Hope & Co., Wolverhampton in 1952 for use on the Fairbourne Miniature Railway. Bought by Jim & Helen Shackell in June 1996.
quickly, it is equipped with a detachable wheel to allow it to be moved like a wheel barrow! The biscuit is fitted with a side valve Villiers engine with separate 3 speed gearbox, which means it has an impressive turn of speed.